Lips That Touch Zombies Shall Never Touch Mine! 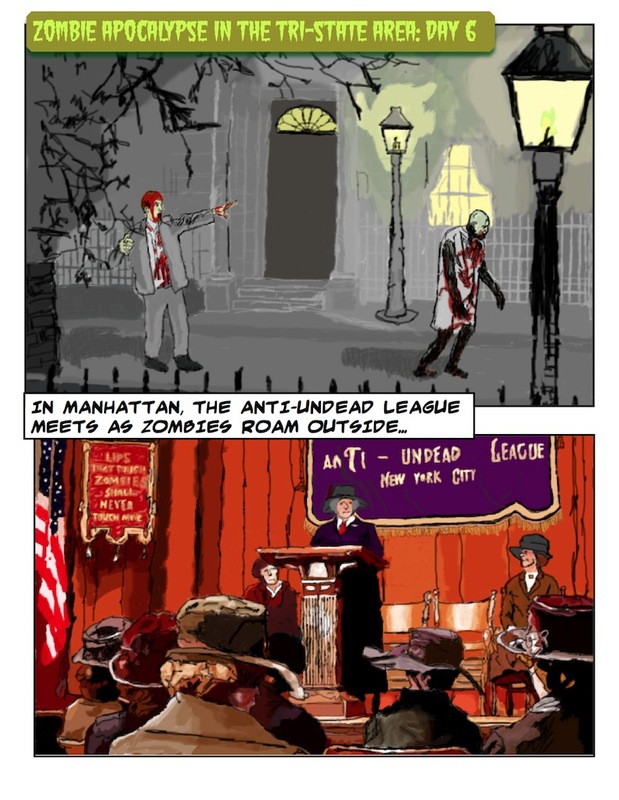 Panel 1: Reanimated corpses, or zombies, wander on a road outside of an old upper class New York building, lined with spiky, wrought iron fences and craggy, wintery trees. The zombie on the left is “fresher” and less decayed, and is reaching out for more food. The zombie on the right is much slower, more decayed, more shambling, and seems to have already eaten someone. Both are lit by gaslights and light from the windows and door of the building. Panel 2: Caption: “In Manhattan, the Anti-Undead League meets as zombies roam outside…” Interior of the building in Panel 1, a meeting room. The Anti-Undead League (AUL) chairwoman stands on a stage, at a podium, in front of red curtains and an old-fashioned purple cloth banner with golden letters that say “Anti-Undead League New York City.” The AUL chairwoman, in a black Victorian dress and hat, is flanked by two other ladies in chairs and two empty chairs. Before the stage are five women seated in the audience, all in period coats and dresses, and big, elaborate, floppy hats adorned with ribbons and flowers. On the far left is an American flag draped down from its flag pole and a red banner with golden tassels hangs down, reading “LIPS THAT TOUCH ZOMBIES SHALL NEVER TOUCH MINE,” in the style of this Temperance League (prohibitionist) slogan.